Steve Bannon Subpoenaed in Russian Investigation, but Will He Snitch? Steve “Big Poppa” Bannon, the former chief strategist to the racist in chief who has been in a full-on fuss fight with the man, has been subpoenaed by special counsel Robert Mueller to appear before a grand jury. I’m praying that Bannon walks into the room and asks for a pack of Newports, a bag of flaming-hot Cheetos and a Styrofoam cup of coffee, because as anyone who watches The First 48 can tell you, anytime the witness starts eating the vending-machine snacks, he’s snitching. 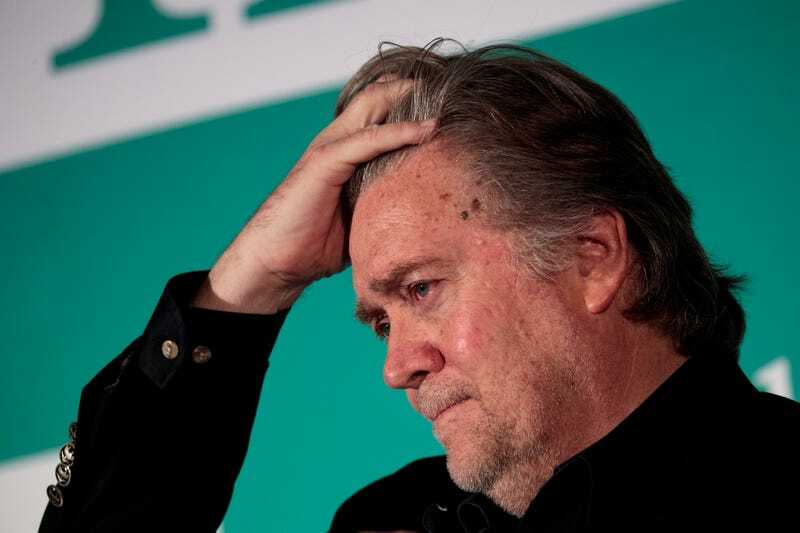 According to the New York Times, Bannon, who is scheduled to meet behind closed doors with a House of Representatives committee on Tuesday, received his subpoena sometime last week. The Times notes that he’s the first close associate of Donald Trump’s to appear before a grand jury. HuffPost notes that while the subpoena has been issued, it’s unclear whether the move is merely strategic to get Bannon to testify before a grand jury or to simply push him to agree to be interviewed. Bannon, once a trusted ally of the president’s, and the man who many believe was the driving force behind many of Trump’s divisive policies during the early portion of his term, had a public falling out after the release of Michael Wolff’s book Fire and Fury: Inside the Trump White House. Bannon bashed his enemy, Trump’s son-in-law and nationwide slumlord Jared Kushner. Trump basically disowned Bannon, booted him from the White House and got real brand-new whenever he was asked about his former chief strategist. Shortly afterward, Bannon stepped down from his position as chief white hood at the white nationalist rag Breitbart. Who knows if Bannon is ready to go full First 48 and reveal everything he knows, but look to him to directly or indirectly take every opportunity to bash Kushner, because the two have never gotten along. Read more at the New York Times and HuffPost.